Mechanical touch technology from Densitron in the UReady TFT rackmount display range integrates mechanical buttons with PCT touch technology. Having a mechanical button makes it easier for operators to be sure they have activated the display, explains Densitron. Currently this is not possible with a traditional touchscreen unless an operator is continuously looking at the screen, as it is difficult to ‘feel’ the correct area of the display. The UReady range of 1U and 2U rackmount displays is designed to bring smartphone-type optical performance to rack systems, delivering twice the resolution of those of a similar size currently on the market, claims Densitron. The addition of the new mechanical touch technology provides users with a more streamlined and cost-effective solution for their studio environments compared with other ‘buttons’ currently available, the company says. 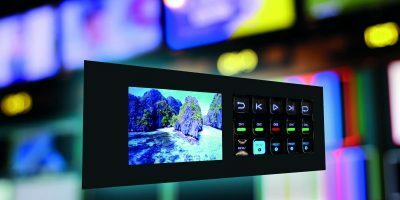 The technology uses the images on the larger display behind it, instead of smaller, individual displays being incorporated within a button. Densitron will demonstrate the technology on a selection of UReady displays at IBC, Amsterdam, the Netherlands, 13 to 17 September. Founded over 45 years ago, Densitron designs and manufactures touch-based human machine interface (HMI) displays tailored to the needs of customers around the world. The company collaborates with customers to understand their particular requirements and then create bespoke products to address those. The company has offices in Asia, Europe and North America and application engineers based worldwide. Densitron’s products can be found in a range of sectors including broadcast, medical, security, automotive, digital signage and gaming. We have a Fitbit to give away on both Softei.com and Weartechdesign.com! Register today to enter the competition to win a Fitbit at softei.com or weartechdesign.com.